Clarksville, TN – Congratulations to Clarksville Police Officer Greg Granderson for receiving a Community Service Award at the 2018 Tennessee Gang Investigator Association (TNGIA) Conference for his tireless efforts to serve the community and advocating the “keep kids out of gangs” credo. The TNGIA, founded in 1998 is made up of local, state, and federal law enforcement, corrections, and court system professionals whose interest or investigative responsibilities include the identification and prosecution of crimes related to gang activity. Clarksville Police Officer Greg Granderson receiving Community Service Award. 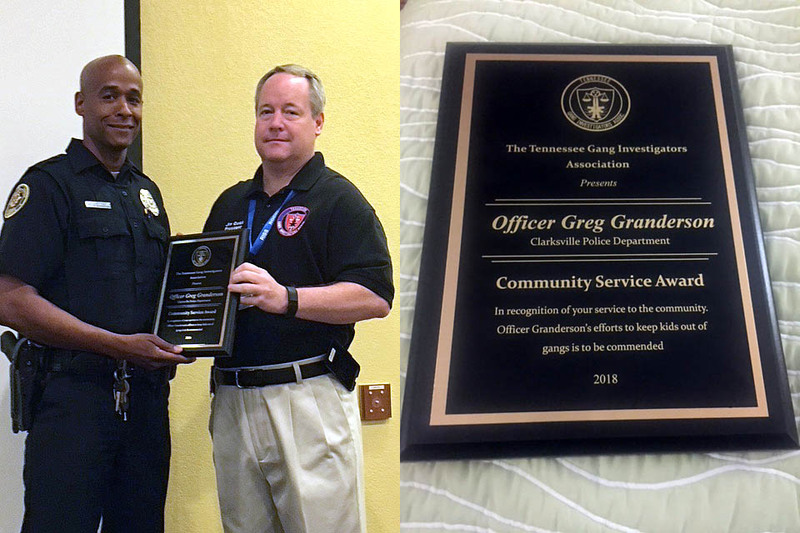 Officer Granderson has been at the forefront of promoting the goals of the TNGIA through his creation of a comic book series for Team GREAT and assuming a leadership and mentor role as a GREAT instructor in our local schools.